Sometimes we take a morning train about 50 minutes north to Manjeshwar village. On an unpaved lane there's a vegetarian eating place run by a shirtless Brahmin with a flower behind his ear. It's tiny, poorly lit and very traditional. We have a small breakfast and then head for the sea. The coast is actually better than at Kappil Beach; it's far more isolated and immensely longer. 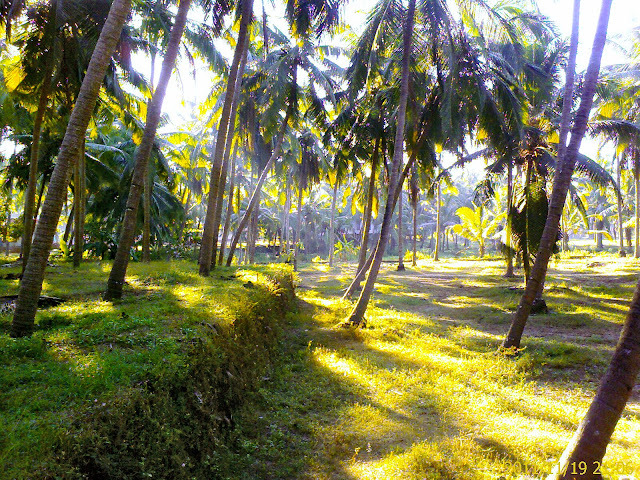 We always walk north in the direction of Kanwatirtha village and choose a pleasant spot to bathe and sun our bodies. The only other person we're likely to see is Jogi Manju who sets simple nets and lines in the surf and always manages to catch a fish. We sometimes walk beyond Kanwatirtha. That gets pretty close to the Kerala-Karnataka state border. Mangalore city is not far away; about 20 mins by bus. The only other western "tourist" this year is Alfred Windig, a long time German-Italian friend of Rene's. They met in Morocco in 1984. We first saw Alfred in Varkala, January 1985. He could hardly speak a word of English then. He manages quite well now. We'll be back in Malaysia on Feb 17th. We'll have to make Malacca our provisional base as we don't have a place to stay in Singapore now. A perplexing dilemma. We need to start essential new research at the National Library and care for some other important things. What's the solution? See also: The work place, On Indian soil, Rene's last walk to the beach, On Laubies's work, Assembling notes around Paul Facchetti. Very charming and informative Blog. Perhaps the only source reference on Laubies available. Renée knew quite a few important names of the artistic demi-monde of that somewhat nostalgic iconic era. Congratulations!